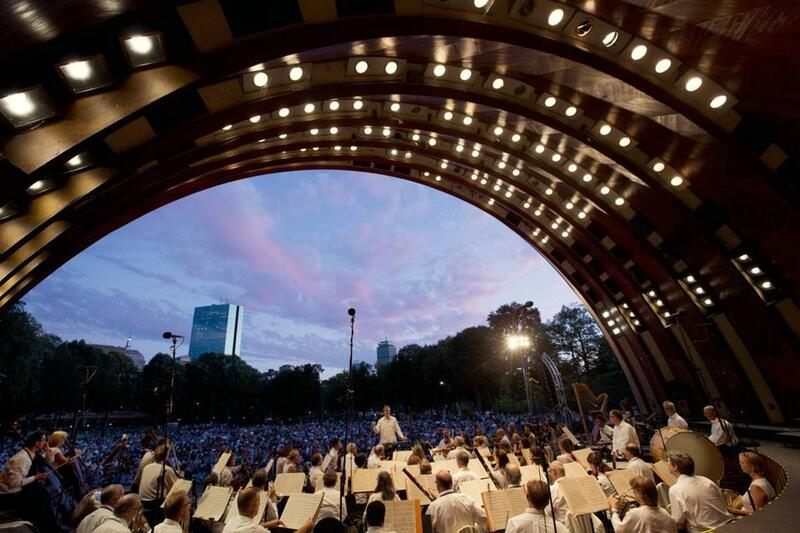 The Boston Landmarks Orchestra, with music director Christopher Wilkins conducting, will begin its 10th season of free Wednesday night concerts at the Hatch Shell July 13. Orchestral music meets West African drumming, followed by Armenian dances and an arrangement of “Footloose,” might sound like an unlikely mix. But it’s all part of the program for a free concert by Boston Landmarks Orchestra this summer. As the fate of the annual July Fourth Fireworks Spectacular hangs in uncertain balance, Landmarks is staying put on the Esplanade. The orchestra’s 10th season of free Wednesday night concerts at the Hatch Shell launches July 13. And, following the lead of Christopher Wilkins, entering his fifth year as music director, the programming remains eclectic, ambitious, unique. Many free-and-open-to-the-public events elect to go the safe route: crowd-pleasing musical comfort food. Landmarks does anything but play it safe. Its eight events this summer will feature imaginative work that crisscrosses genres. Wilkins does hope to shrink the gap between orchestral and popular genres. Music, as he sees it, should be a communal experience, regardless of style. Partnerships with more than 30 local organizations help to patch together an inclusive and varied repertoire. Scheduled collaborations include a joint performance with the Commonwealth Shakespeare Company, a night dedicated to dancing called “Footloose Free and Fancy,” and the incorporation of birdsong into the repertoire with the help of Mass Audubon Society and other environmental groups. For purists, there’s always something to enjoy. Wilkins said every program includes at least one major classical orchestral work. It just might be followed by something a little new and different. One of the orchestra’s most ambitious ventures will air during its “Landmarks Lollapalooza” concert night on Aug. 10. Four high-school students from the music education nonprofit ZUMIX collaborated with composer Gonzalo Grau to write a 20-minute piece for the ensemble. The students weren’t trained in classical composition beforehand, so Grau worked to teach them needed skills as they wrote the piece. They sent audio recordings and ideas back and forth through the Internet, which Grau then wove into a symphonic framework. “This collaboration was very true,” Grau said. “In the piece there are transitions and sections that I wrote in order to connect the whole story, but all the musical elements and ideas come from the kids.” Madeleine Steczynski, executive director of ZUMIX, said that the four students — Angelina Botticelli, Sebastian Jaramillo, Irisbel Rojas, and Justin Garcia — were delighted to see their names listed right below Grau’s on the sheet music. Grau’s remarks on the project echoed Wilkins’s broader goals with Boston Landmarks Orchestra. “When contemporary classical music turns into something that is very complex and intellectual, music is separated from the people,” Grau said. He views this project as a step toward reconnecting classical and popular music. This collaboration was the inverse of the typical effort to engage youth with music, even those undertaken previously by Landmarks. In most cases, teenagers have learned music composed by adults, and performed alongside them. Here, the teens were the genesis of the creative process. Last year’s free concerts drew more than 25,000 audience members throughout the season. The orchestra hopes to see similar numbers this year. And if the programming gets a little kooky at times, well, who doesn’t like kooky? “If it’s a little screwball, all the better,” Wilkins said. Sophie Haigney can be reached at sophie.haigney@globe.com or 617-929-2560. Follow her on Twitter at @SophieHaigney. A previous version of this story inccorectly stated the day that this program begins. It’s July 13.